Then Why Haven’t You Put Any Restrictions on Big Oil and Big Ag? Governor Jerry Brown is leading the nation and perhaps even the world in his efforts to do something about climate change and global warming which is causing epic drought conditions in California. He has mandated that greenhouse gas emissions must be reduced to 40 percent below 1990 levels over the next 15 years. Brown called this the most aggressive benchmark enacted by a government in North America. All well and good. In addition to getting more electric cars on the road and making power plants get their energy from renewable sources, Brown has also addressed California’s water crisis. With the Sierra snowpack virtually nonexistent, California is having to get creative about where it gets its water supply. “With this order, California sets a very high bar for itself and other states and nations, but it’s one that must be reached — for this generation and generations to come,” Mr. Brown said. These efforts come as this state has been struggling with a drought that Mr. Brown has said is, at least in part, exacerbated by global warming. With Green House Gasses (GHGs) reaching the benchmark level of 400 ppm for the entire month of March 2015 for the first time in world history, actions to reduce those levels to a sustainable 350 ppm have been lagging behind. Meanwhile, severe weather such as the recent extreme floods in Chile and Australia, daily tornado watches in the US and the early advent of hurricane season are pounding into our consciousness the extreme seriousness of the global warming threat. But the Governor, formerly known as Governor Moonbeam, has done little to refrain Big Oil and Big Ag from using most of the water in the state. The large population of California only uses 10% of the total water; agriculture uses 41%, with the rest diverted for environmental causes and captured by the state’s dams, reservoirs, aqueducts, and other infrastructure. Agriculture accounts for roughly 80 percent of human-related water consumption in the state. Much of that comes from large-scale farms in California pumping billions of gallons a year of fresh groundwater to keep producing thirsty crops and animal products for supermarkets across the country—a “case study in the unwise use of natural resources,” the New York Times wrote last month. Meanwhile, cities and water agencies will be required to implement 4 to 36 percent cutbacks, depending on the area. San Francisco must reduce its usage by 8 percent, Los Angeles by 16 percent, San Jose by 20 percent, and Sacramento by 28 percent. Failure to meet those targets could result in fines against water agencies of up to $10,000 a day. State legal advisers will review the rules before they are implemented. The idiocy of this policy is that water intensive crops like almonds and rice are grown in the middle of what amounts to a desert instead of in vast areas of the nation which are literally saturated with water. At 1.1 trillion gallons per year, almond farms alone consume 10% of the state’s water, or as much as the entire city of Los Angeles. With agriculture pumping huge amounts of groundwater which is not being replenished, the question naturally arises when will this water run out and what will farmers do then? Every day we are subjected to TV commercials from the oil and gas industry that tell us how proud we should be that the US is now number one in the production of natural gas and soon to be numero uno in the production of oil thanks to the miracle of fracking. They say little about the fact that we are number one in the production of materials that will increase the amount of GHGs in the atmosphere and hasten the destruction of the planet. These fossil fuels need to stay in the ground and not be pumped or fracked out, but the fossil fuel industry is insistent and adamant about doing so and our free enterprise economy allows them to do so. In this case it would be better if free enterprise wasn’t so free. California’s oil and gas industry uses more than 2 million gallons of fresh water a day to produce oil through fracking, acidizing, and steam injections, according to environmental estimates. In 2014, California oil producers used up nearly 70 million gallons of water on fracking alone, state officials told Reuters on Thursday. While that number is lower than projected, fracking and toxic injection wells must not be given “a continuing license to break the law and poison our water,” Zack Malitz, an organizer with environmental group Credo, told Reuters. Governor Brown needs to get his ducks in a row by imposing constraints on Big Oil and Big Ag. If he wants California to lead on environmental issues, he needs to step up to the plate and convert the state to renewable energy production as quickly as possible while at the same time imposing restrictions on the gas and oil industry. Governor Cuomo of New York has banned fracking in his state. 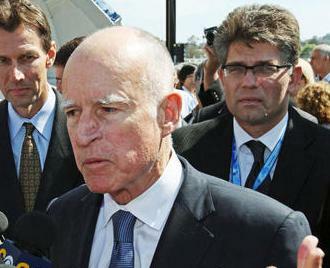 Governor Brown needs to follow his lead and ban fracking in California. Renewable energy can be used in the conversion of sea water (of which the state has an abundance) to fresh potable water. The state needs to get behind a massive project to do just that. For too long California has depended on the snowpack in the Sierra Mountains and on water from the Colorado River, a river that is shared with several other states. Building desalination plants up and down the California coast would not only give California a more dependable source of fresh water but would provide a lot of jobs that would be good for the economy. So where would the money come from to build all these desalination plants? A Public Bank of California could provide the money interest free by creating and spending it for this purpose.